I have read multiple tutorials and blog posts that each seemed to provide a piece of puzzle. This article shows the full story – in its simplest form. 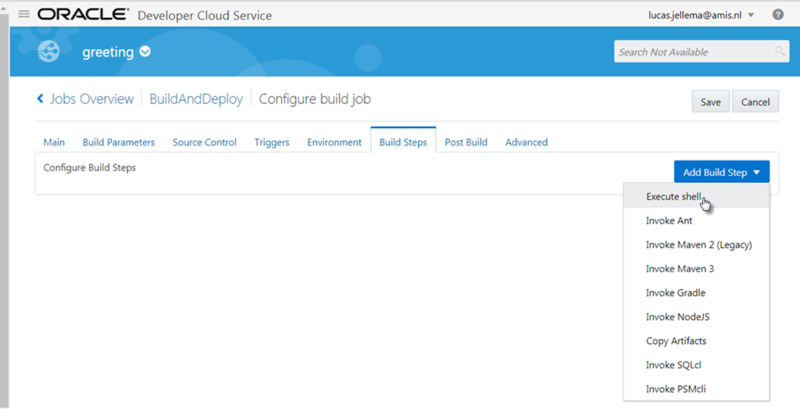 Prerequisites: access to a Developer Cloud Instance and an Application Container Cloud service. 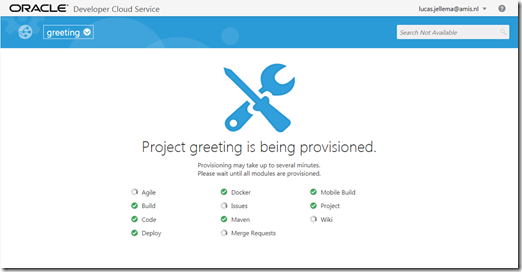 Locally access to git and ideally Node and npm. Sources for this article are in GitHub: https://github.com/lucasjellema/greeting . 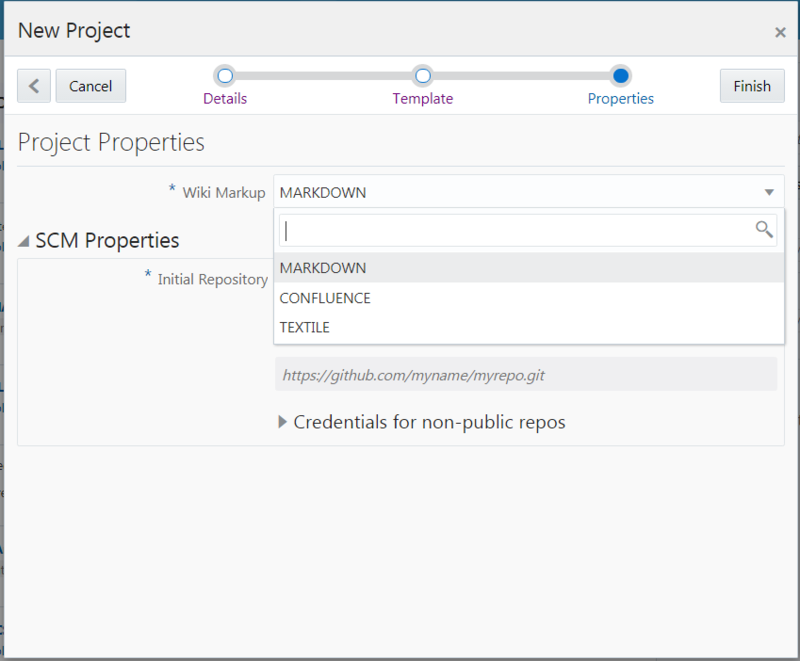 After you press Finish, the new project is initialized along with all associated resources and facilities, such as a new Git repository, a Wiki, an Issue store. 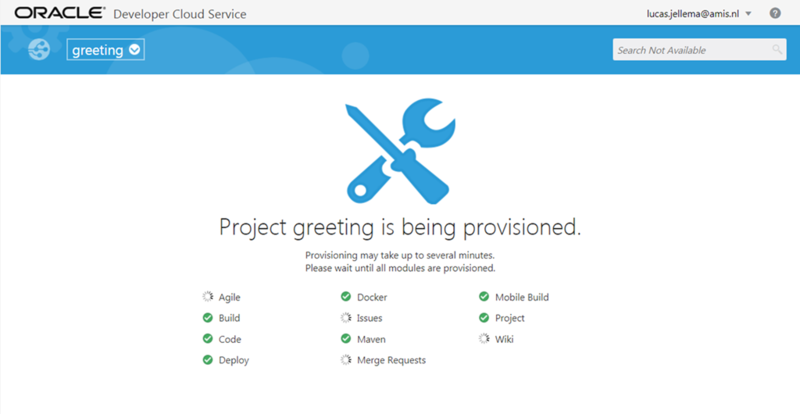 When the provisioning is done, the project can be accessed. 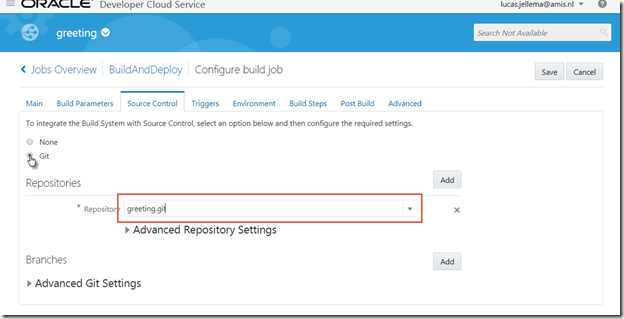 Copy the git URL for the source code repository. 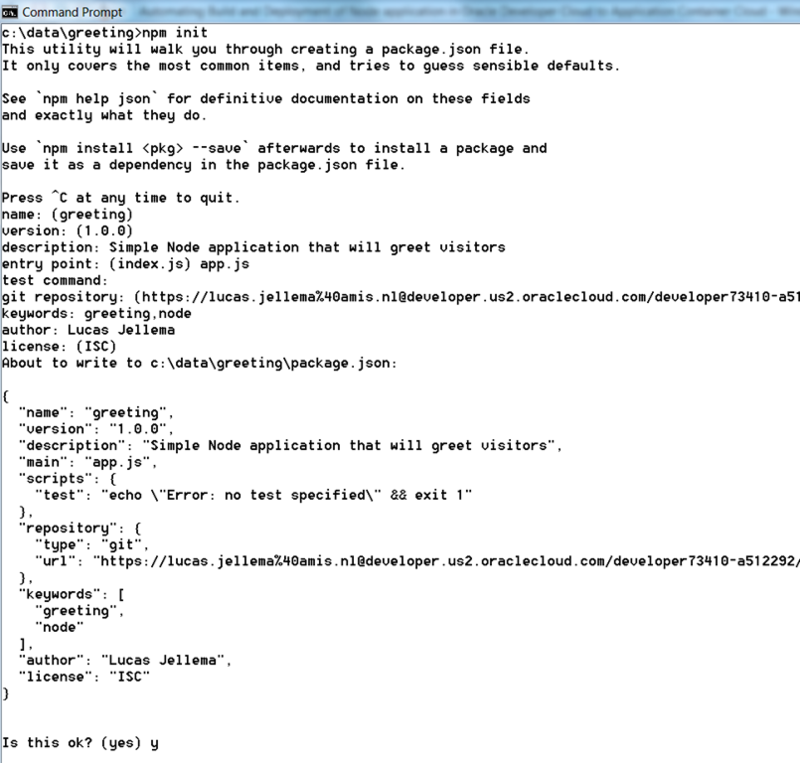 This will create the package.json file. 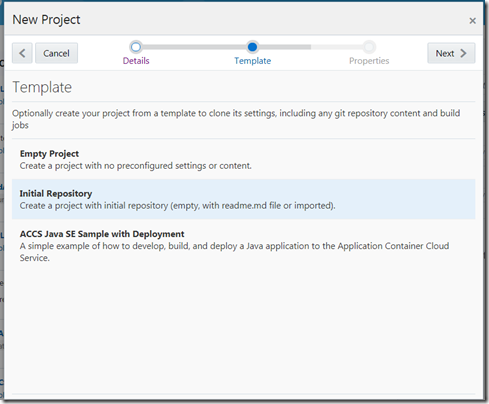 To prepare the application for eventual deployment to Application Container Cloud, we need to add the manifest.json file. We also need to create a .gitignore file, to prevent node_modules from being committed and pushed to Git. Note how the greeting can be read from an environment variable, just like the port on which the requests should be listened to. When no environment values are provided, defaults are used instead. 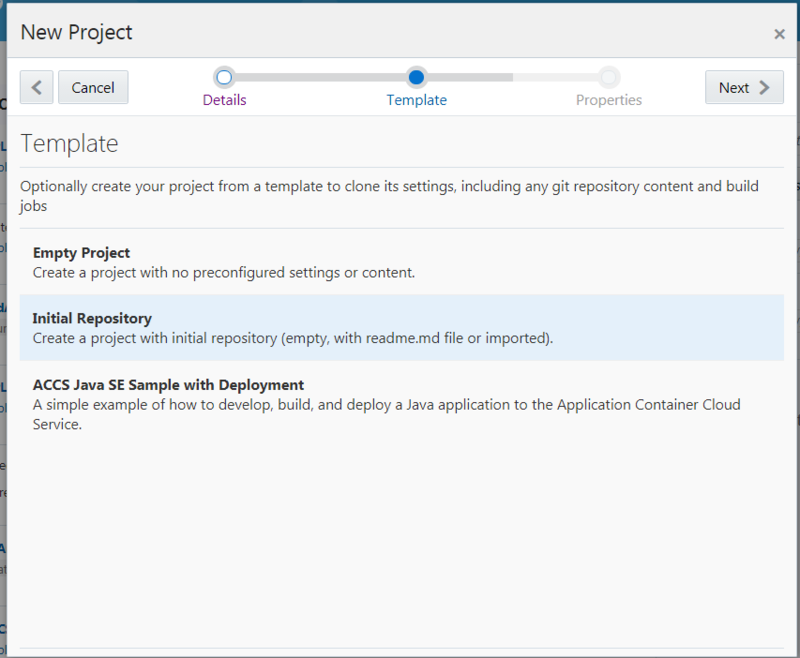 To have the application build we can create a build job in Developer Cloud Service that creates the zip file that is suitable for deployment; this zip file needs to contain all sources from Git and all dependencies (all node modules) specified in package.json. 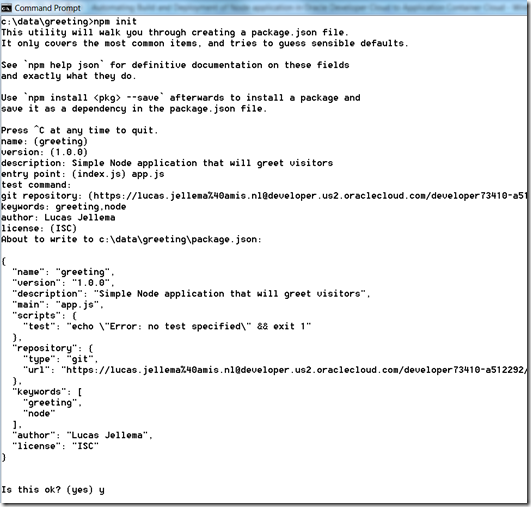 The job is triggered by changes on the master branch in the Git repo. Note: the build job ideally should also perform automated tests – such as described by Yannick here. Specify free-style job. Specify the name – here BuildAndDeploy. 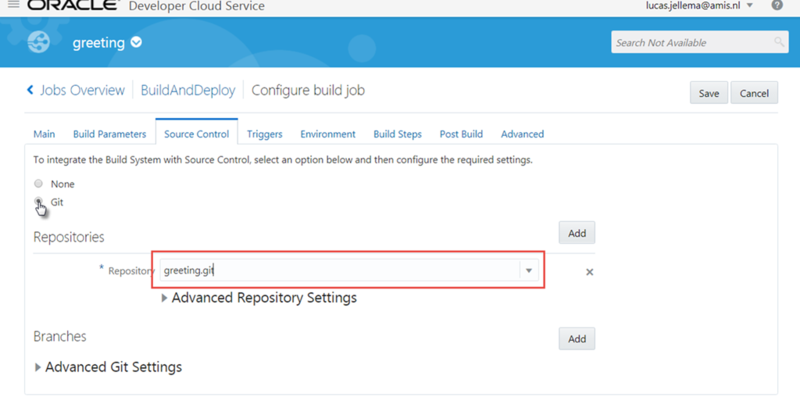 Configure the Git repository that contains the sources to build; this is the repository that was first set up when the project was created. 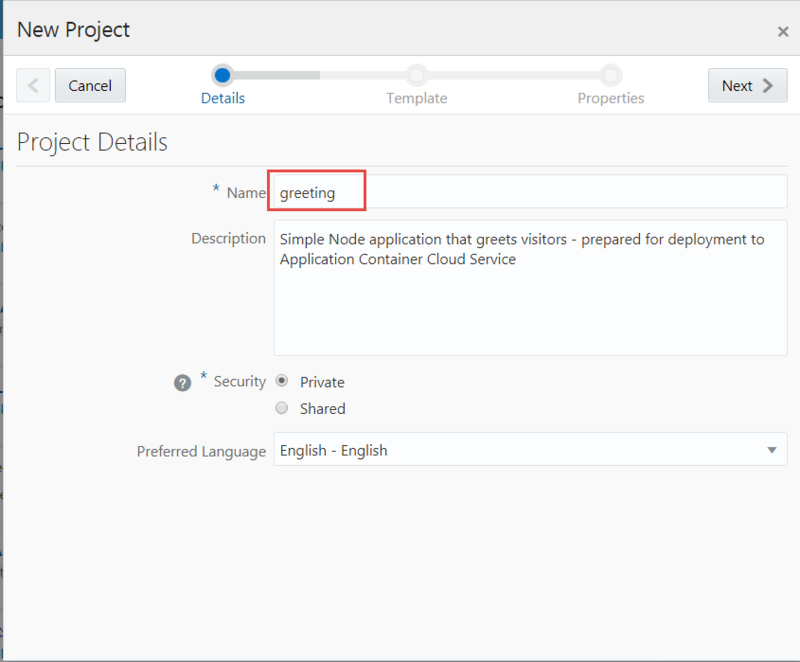 This will download all required node modules and package all sources in a single zip-file called greeting.zip. Define as post build step that the greeting.zip file should be archived. 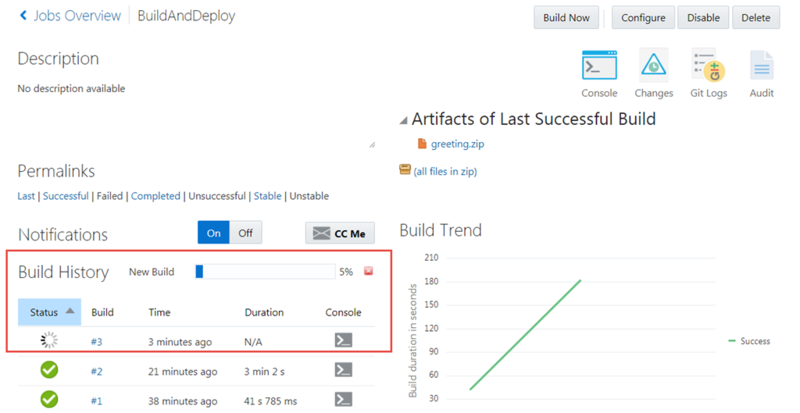 That makes this zip file available as artifact produced by the build job – for use in deployments or other build jobs. 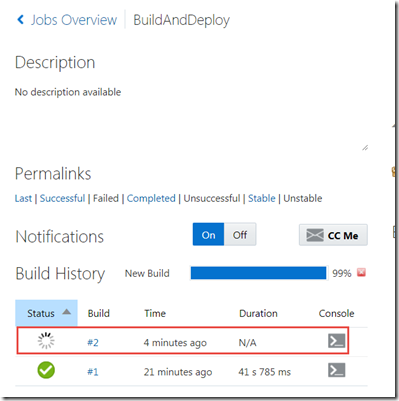 Run the job a first time with Build Now. The console output for running the shell commands is shown. 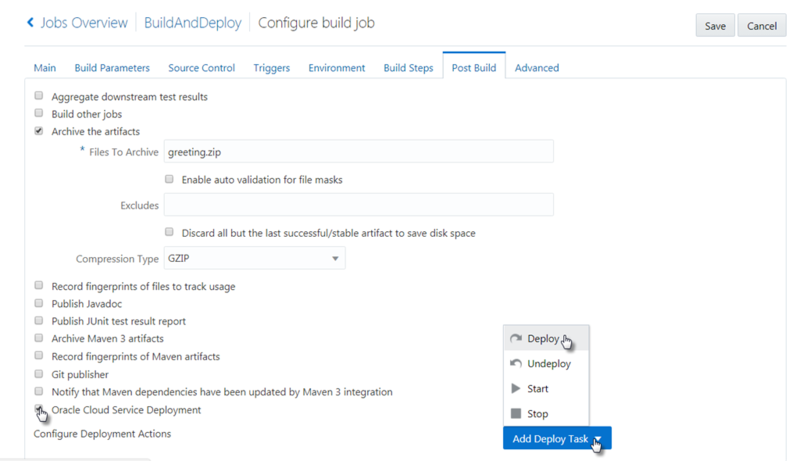 Note that the implicit first steps performed in a build include the retrieval of all sources from the git repositories on to the file system of the build server. 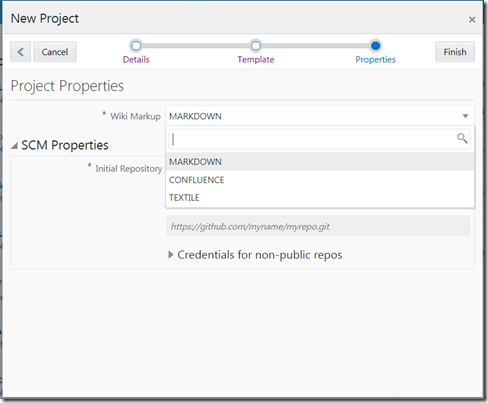 The explicit shell commands are executed subsequently – and can make use of these cloned git repo sources. 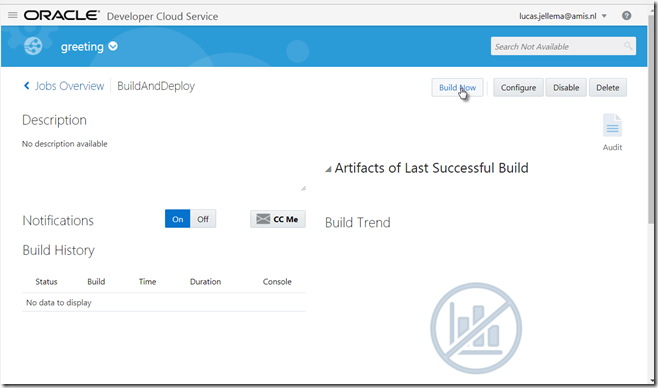 The build job produces an artifact that can be deployed to an ACCS instance. We need a Deployment to create an ACCS instance based on that artifact. The Deployment is the bridge between the build artifact and a specific target environment – in this case an ACCS instance. 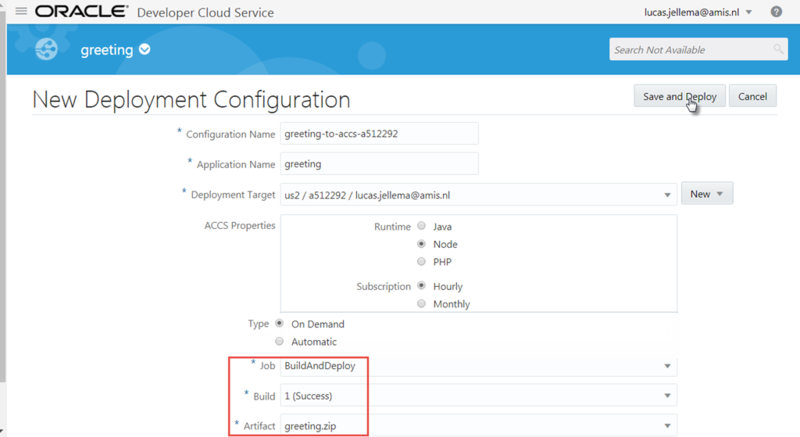 Specify name of the configuration – for use within Developer Cloud Service – and of the application – that will be used in Application Container Cloud. Specify the type of Deployment – we want On Demand because that type of Deployment can be associated with a Build job to be automatically performed at the end of the build. 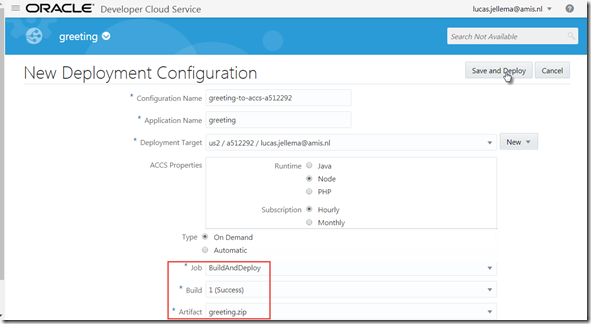 Specify the Deployment Target – New of type Application Container Cloud. 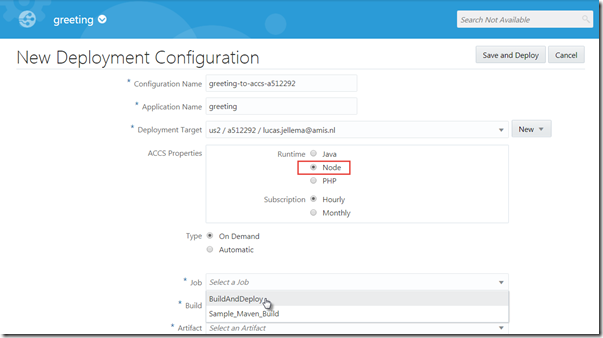 Provide the connection details for an ACCS instance. Press Test Connection to verify these details. Upon success, click on Use Connection. 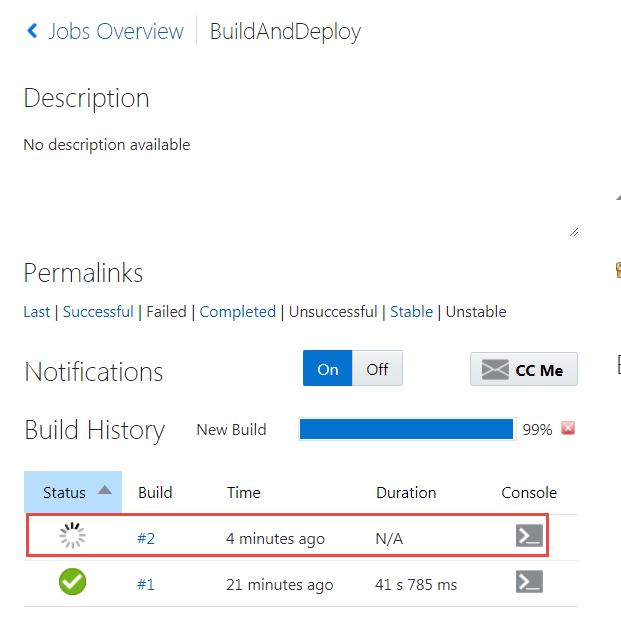 Note: for now, the Deployment is tied to a specific instance of the build job. 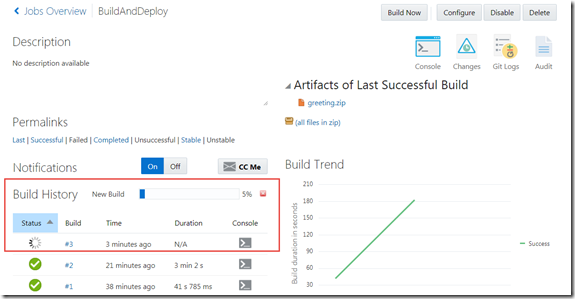 When add the Deployment as Post Build step to the Build Job, we will always use the artifact produced by that specific build instance. 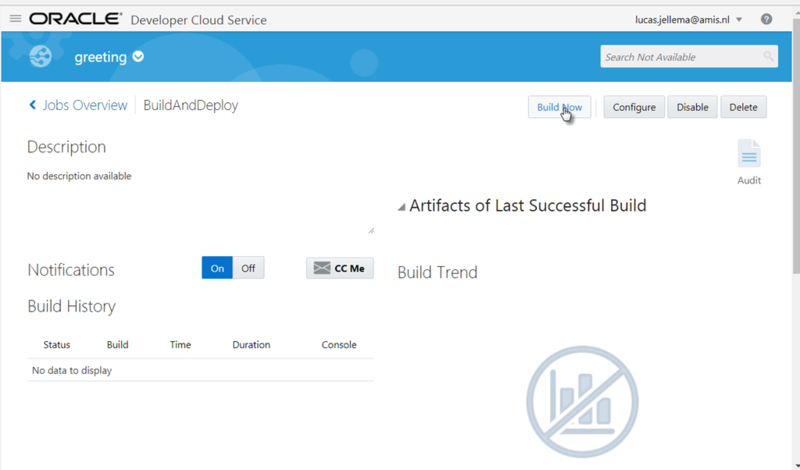 And press Save to save the changes to the build job’s definition. The ACCS console shows that now we have Version 2.0, deployed just now. This line references the environment variable GREETING – that currently is not set. 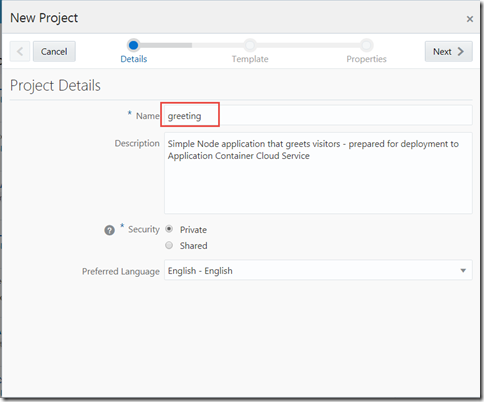 By defining a deployment descriptor as part of the Deployment definition, we can not only specify the number of instances and their size as well as any Service Bindings and the value of Environment Variables such as GREETING. Note: variable APPLICATION_PREFIX is not currently used. If we make a change in the application and commit and push the change to Git then after some time we should be able to verify that the live application gets updated. 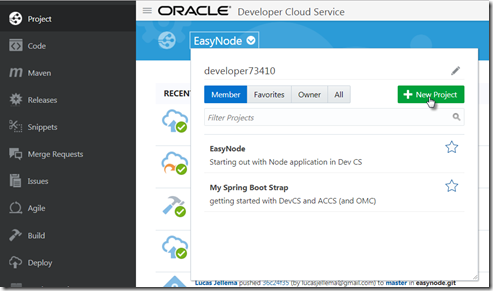 Make the change – a new version label and a small change in the text returned by the application. 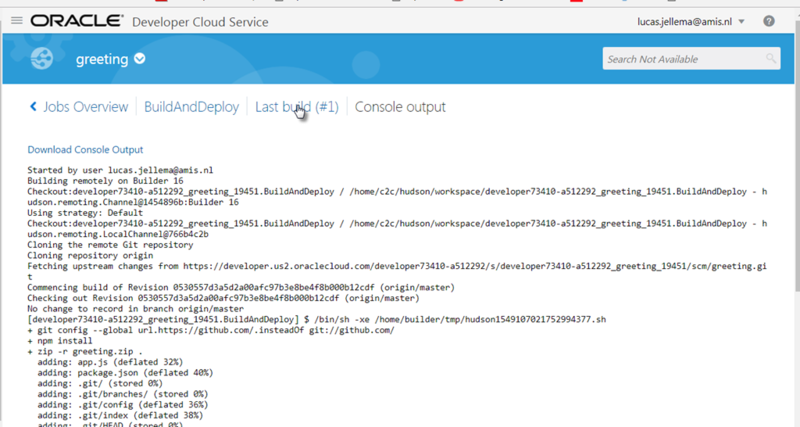 So editing the source code and committing plus pushing to git suffices to trigger the build and redeployment of the application – thanks to the set up made in Developer Cloud Service. 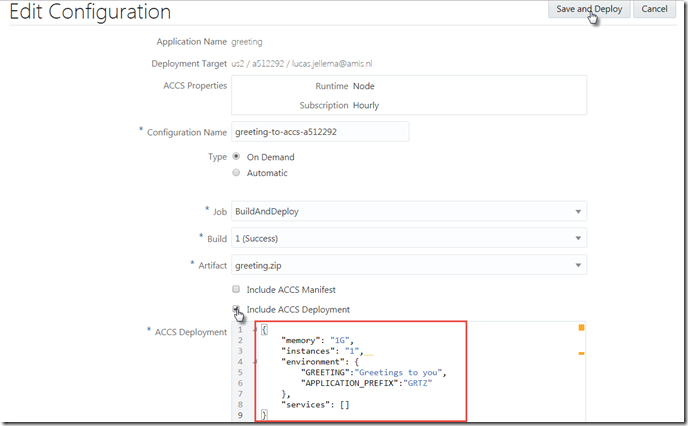 Show how multiple instances of an application each have their own state – and how using an Application Cache can make them share state. 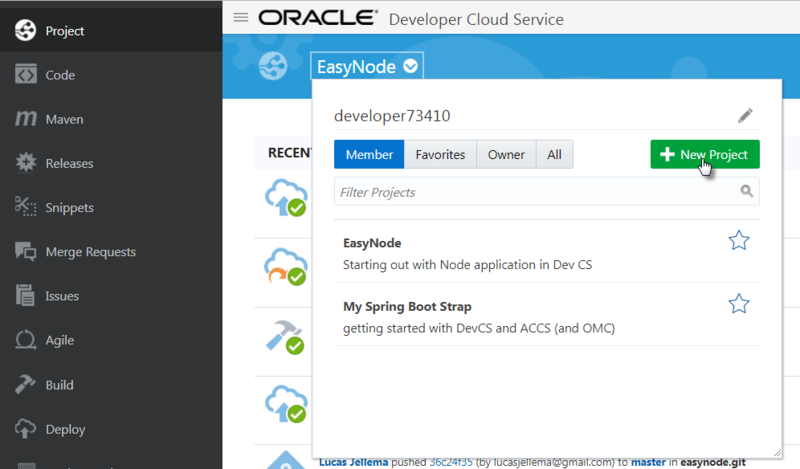 Show how an ACCS application can easily access a DBaaS instance through Service Bindings (and in the case of Node application through the oracle node driver and OCI libraries that come prepackaged with the ACCS Node Runtime. 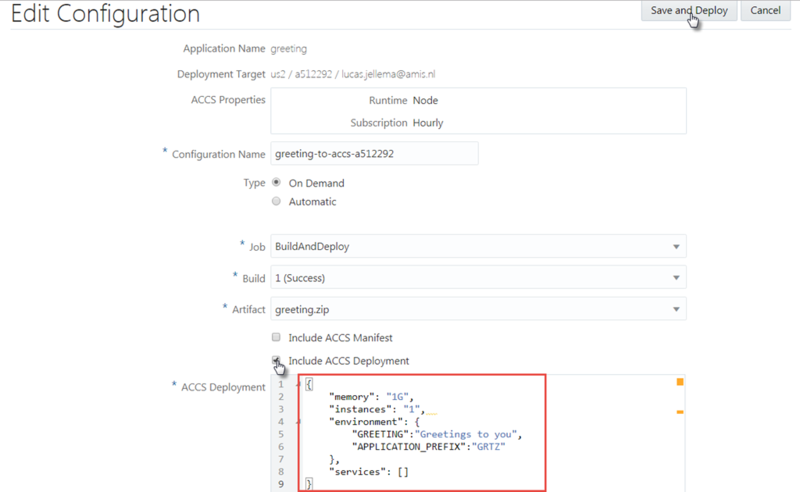 Show how Oracle Management Cloud APM can be setup as part of an ACCS instance in order to perform application monitoring of applications running on ACCS; probably works for Log Analytics as well. Sources for this article are available in GitHub: https://github.com/lucasjellema/greeting. 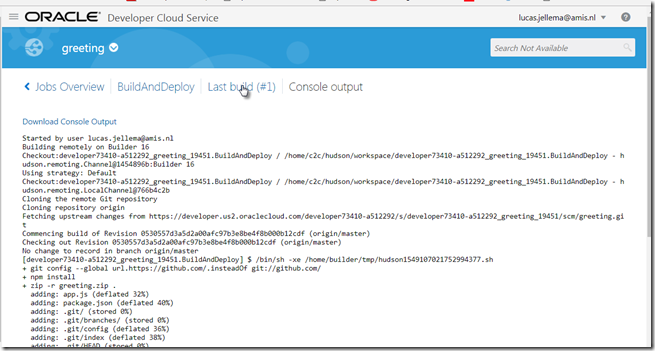 Can you please explain, how is the build job links with a particular application in the Git and builds that particular application only? What I mean in, if I have 5 applications in my Git and updates any one of them, how will Dev CS identifies, which particular job to build? Lucas – nice job walking through the steps. Very well done!